The fluid, unique look of Solera® Soft Shades is created by combining the soft folds of a classic Roman shade with the construction of a cellular shade. Internal lift cords provide a clean look, and enhanced child and pet safety. The Solera® fabric collection is full of luxurious woven and innovative non-woven fabrics, colors, textures and patterns. To suit your needs, every fabric is available in both light-filtering and room-darkening opacities. The Top-Down/Bottom-Up design option lets you the ability operate Solera® shades from the top down or the bottom up. This meets all your privacy needs and still gives you access to natural light. Solera® Soft Shades combine the soft, sculpted look of Roman shades with the energy efficiency and simplicity of a cellular shade. The soft folds create pockets that trap air and increase insulating properties. The cellular construction of Solera® Soft Shades increases insulating properties and helps to lower your energy consumption, ultimately reducing your heating and cooling bills. It can also improve your room’s acoustics while reducing the intensity of outside noise. Solera® Soft Shades are designed and custom-crafted in the U.S. with the highest level of quality. Best of all, every window treatment from Hunter Douglas is covered by our lifetime limited warranty. Luxurious woven and non-woven fabric options are available in both light-filtering and room-darkening opacities. A fabric-wrapped headrail and bottomrail with color-coordinated hardware finish off the custom look. We can bring the showroom to you! Call us today, for your FREE estimate! Solera® Soft Shades can be operated from the top down, the bottom up or both, so you can control light and privacy in endless ways. Internal lift cords allow for enhanced child safety and a clean, tailored look. This is just a few of our fabric choices. Please contact us to see all colors and textures. Hunter Douglas thinks about every last detail when designing and engineering their products. When Solera® Soft Shades were designed, it was meant to be a very elegant look, similar to the Vignette® Modern Roman Shades. 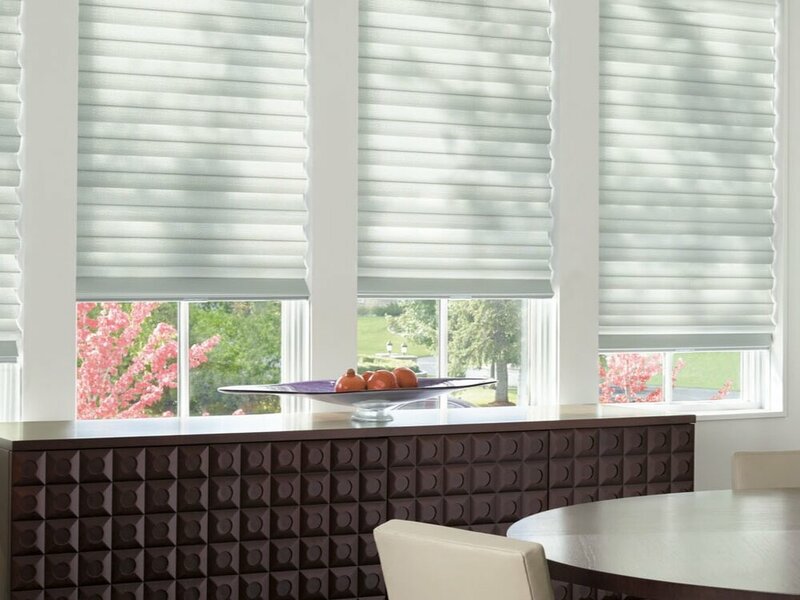 Lovitt Blinds & Drapery is your local Hunter Douglas dealer for Downers Grove, IL & Northbrook, IL and ALL of the surrounding areas. Our experienced design professionals will help you choose the colors, textures and finishes that complement your interior décor beautifully. We will also measure your windows to ensure a perfect fit. Contact us today to see the Hunter Douglas Solera Shade Shade® collection in person! REQUEST A CONSULTATION to see all colors and get a free estimate! Click here for the Hunter Douglas rebates!